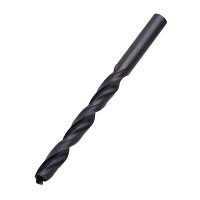 There are two types of machine drill, the bench drill and the pillar drill. The bench drill is used for drilling holes through materials including a range of woods, plastics and metals. It is normally bolted to a bench so that it cannot be pushed over and that larger pieces of material can be drilled safely. The larger version of the machine drill is called the pillar drill. This has a long column which stands on the floor. This can do exactly the same work as the bench drill but because of its larger size it is capable of being used to drill larger pieces of materials and produce larger holes. 1. Always use the guard. 2. Wear goggles when drilling materials. 3. Clamp the materials down or use a machine vice. 4. Never hold materials by hand while drilling. 5. Always allow the ‘chippings’ to clear the drill by drilling a small amount at a time. 6. Follow all teacher instructions carefully. 1. Draw a bench drill and label the most important parts. 2. List safety factors regarding the use of the drilling machines. 3. Demonstrate the use of the bench/pillar drill to a group of pupils, emphasising safety. Used for drilling holes. A normal drill set will include sizes from 1mm to 14mm. Used for larger diameter holes. When using this bit the hole is drilled very slowly so that the bit does not 'jam' in the wood. 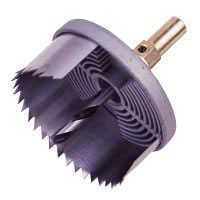 For large diameters a 'hole saw' can be used. 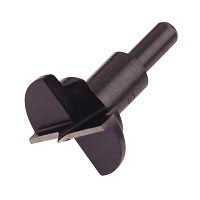 The advantage of this type of drill bit is that the blade can be changed to give different sizes of diameter. 1. 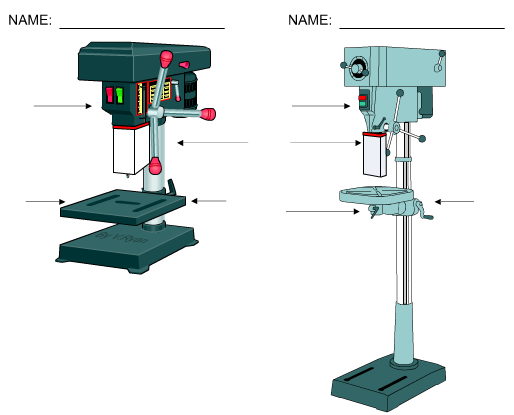 Two common types of drilling machine are seen below. Name both types. 3. The main difference between the two machine drills is their overall size. Why is one much smaller than the other? Include a description of the type of work normally carried out on the smaller drill, as part of your answer. 4. 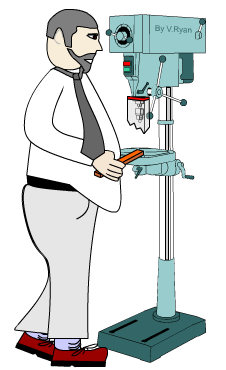 List four safety rules governing the use of drilling machines. 5. Three types of drill bit are seen below. Name each ‘bit’ and write a general description of the type of drilling each is capable of producing, when used in conjunction with a drilling machine. 6. The machine drill shown opposite is being used in a very dangerous manner. Identify and describe all the dangers.